ST. PAUL, MINNESOTA, October 4, 2016 – This summer, James City County, Virginia became the first locality in the Hampton Roads area to offer its public, education and government (PEG) programming to television audiences in high definition. Powering playout for the community broadcaster's new HD channels are Cablecast Flex multi-format video servers and Cablecast Broadcast Automation software from Tightrope Media Systems (TRMS). "We were eager to move to HD to offer a better television experience for our viewership," said Randall Hisle, chief video engineer for James City County. "Other than our PEG content, all of the channels on our local cable system were already HD, so we needed to upgrade to meet our viewers' quality expectations. Most of our recent production equipment and infrastructure was HD-ready, so when Cox Communications allowed us to start transmitting in HD, upgrading our Cablecast playout platform was the final piece of the puzzle." A joint venture of James City County and the City of Williamsburg, the television studio and headend at the James City County Community Video Center host production and playout for four separately-programmed channels. Three of the channels – the county and city's jointly-run community and education stations, plus James City County TV, the county's government station – are now distributed in both HD and SD, while the fourth, the city's distinct government channel, is available exclusively to Williamsburg residents in SD. Cablecast gives us room to grow, whether on television or with dedicated channels for video displays in public spaces. Supplied by reseller Whitlock Group, two Cablecast Flex 4 servers provide playout for the four channels plus dual simultaneous recording capabilities, while offering two additional, configurable input or output channels for future expansion. "The Cablecast Flex 4 servers give us the flexibility to run the county's new HD channels and city's SD-only channel all from the same platform," said Hisle. "They also give us room to grow, whether on television or with dedicated channels for video displays in public spaces. The servers' integrated up/down conversion has also been handy in our transition, letting us easily blend existing SD content into our HD channels." The HD deployment gives James City County the same rich functionality and operational benefits that it enjoyed for years with the county's SD Cablecast system, starting with the software's easy-to-use, web interface. 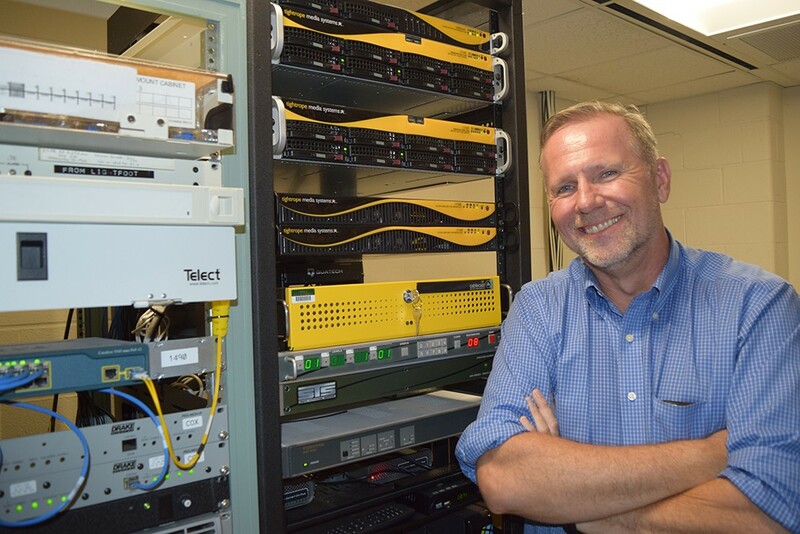 "Before Cablecast, it was a huge challenge for our small team at the Community Video Center to take care of all of the programming needs for everyone we served," explained Hisle. "Cablecast lets us distribute that effort to the schools, city and various departments to do their own programming and scheduling. They can access Cablecast via the web, and it's easy enough for them to operate themselves. It creates a lot of freedom for each of the channels to do their own thing, while taking a lot of the workload off of us." Cablecast lets us distribute the programming work to other departments. They can access Cablecast via the web, and it's easy enough for them to operate themselves. James City County also uses Tightrope's Carousel Digital Signage Software to manage the bulletin boards related to each of the county's three channels, and Hisle praises the seamless workflow between it and Cablecast. "Their tight integration lets Carousel automatically create bulletins from the Cablecast schedule and announce upcoming programs," he elaborated. "It's another great example of how well Tightrope understands and addresses the unique needs of community TV broadcasters. Cablecast and Carousel allow our very small staff to easily manage our multiple channels and bulletin boards in a unified manner, delivering operational efficiencies while letting us combine our video and bulletins together into a great-looking result." Overall, the new HD Cablecast deployment continues to impress Hisle as much as when the station chose Cablecast eight years ago. "When we first discovered Cablecast, it blew us away, as we couldn't find anything else that could do what it did," he recounted. "While we've been completely satisfied, due diligence and our procurement processes required me to research multiple vendors' products for our HD upgrade project. There's still nothing else like Cablecast, and there's still nobody else out there bringing PEG stations the benefits that Tightrope does."